BBC Parliament is a television channel from the BBC. Its remit is to make accessible to all the work of the parliamentary and legislative bodies of the United Kingdom and the European Parliament. 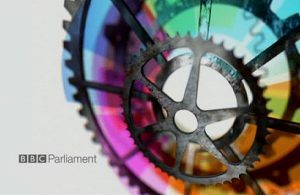 It broadcasts live and recorded coverage of the House of Commons and House of Lords, Select Committees of the UK Parliament, the three devolved assemblies, being the Scottish Parliament, the Northern Ireland Assembly and the Welsh Assembly, and occasionally from the General Synod of the Church of England. The channel also broadcasts reports from the European Parliament and the yearly party conferences of the main UK political parties and the Trades Union Congress. Whenever the House of Commons is in session, BBC Parliament covers the chamber live. Additionally, the House of Lords is shown on the channel on the same day and following day when it in session, in sections that fit around the Commons. Whenever both Houses are in recess, but a devolved assembly is constituted, the channel will provide live coverage of its work. Thus, when taken together with both live and recorded coverage from the other bodies it covers, BBC Parliament’s schedule is dominated by direct broadcasts of the legislative and political institutions – whether they be plenary, quasi-plenary (such as Westminster Hall), or in committees – that affect British public life. However, BBC Parliament shows a variety of other recorded programmes, taken from across the BBC’s national and international channels. The channel also carries some American programming from C-SPAN. See the BBC Parliament website for more information. All FilmOn streams start with an ad, this can be skipped after eight seconds. To view in full screen, click on the top righthand corner, press Esc to minimise.